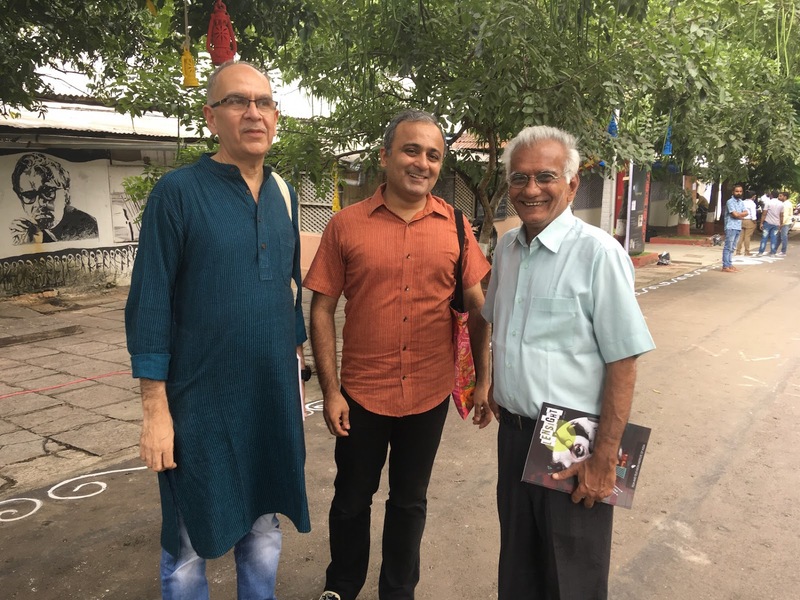 “I’m doing well,” Kundan Shah said when I asked about his health at the Film and Television Institute of India in Pune just last week. “There are ups and downs, of course. But I walk a lot, and as long as I can do that, I’ll be okay.” We were at the FTII to participate in a Hrishikesh Mukherjee tribute, and when I heard the shocking news yesterday about Kundan passing away in his sleep, my first reaction was to be grateful that I had those few minutes with him in Pune. It was our last, and warmest, meeting. When I came down from the stage after a session, he was kind enough to greet me from the front row and say he enjoyed the talk. I played fly on the wall during a tea session as he chatted with old friends and colleagues about their institute days, discussing the difference between Bimal Roy’s and Hrishikesh Mukherjee’s approach to shot-taking, or Guru Dutt’s and Sanjay Leela Bhansali’s use of melodrama. And beneath the FTII’s famous Wisdom Tree, we posed for this photo alongside Amit Tyagi, the dean of films who had, in another lifetime, played the small part of the bearded reporter asking Tarneja hard questions in Jaane bhi do Yaaro’s press conference scene. Posting the picture on Facebook last week, I was presumptuous enough to call it “a mini-gathering of Jaane bhi do Yaaro people”. But then Kundan himself had told me, after my book about his film came out in 2010, that I was now officially “part of the team” – among the sweetest words I have heard as a writer-journalist, and it was unsurprising that they came from a lovely, down-to-earth man. A man whom I had come to think of as a friend, despite the 30-year age gap between us. It hadn’t been like this in March 2009, when I rang the bell of his Bandra office for the first time. If I wanted his inputs for a book about Jaane bhi do Yaaro, he had said curtly on the phone, I must come to Bombay and meet him so he could gauge firsthand if I was the right person to do this. The initial few exchanges (“Arre, why do you want to write about this film? Who will read such a book?”) made me feel like I was in a job interview and had to speak in platitudes to prove my worth. But gradually, the ice melted. We began talking, and kept talking for another week – followed by another long series of conversations two months later. Even once a rapport was struck, there was quite a bit of parrying: with him as the artist who could get evasive about his work, or just be uncomfortable about discussing it in too much detail; and me, the chronicler who probed, speculated, asked inconvenient questions or even said uneducated things. At the time, my experience of old Hindi cinema was limited, and Kundan sometimes got annoyed when I didn’t get one of his specific references, or when it turned out I hadn’t seen a film like Teen Bahuraniyan or Paigham, which had been a formative influence on his sense of comedy. You should have researched much better before coming here and trying to write a book about JBDY, he said in one of his sourer moments – though the crankiness never lasted more than a couple of minutes, and he lightened up on realizing that I knew Buster Keaton and Harold Lloyd. The overriding impression was of a very regular-looking man – a civil servant in a checked shirt, diligently keeping 9 to 5 hours (much like the Common Man Wagle from the TV show he directed in the 1980s) – whose head was full of zany ideas. So full of them that I have wondered at times if this didn’t become a kind of roadblock for him: he seemed to flit from one thought process to the next, he was constantly revising and tweaking, and this can sometimes prevent you from concentrating on one thing and getting it finished. 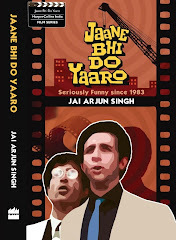 I have a draft – one of many he wrote – of the mythical JBDY sequel which never got made, and it’s great fun to read (emerging after 25 years in jail, Vinod and Sudhir now find themselves in such an unapologetically corrupt India that they can only cope by growing little devils’ horns on their heads!) – but it is also all over the place, uneven and fragmentary, often incoherent and non-sequiturish. But then, this would have been just as true for the original JBDY script, and look how that turned out. We watched Jaane bhi do Yaaro together on his laptop. He laughed quite a bit, but more AT the film than WITH it – pointing out lapses in editing or an awkward moment in the acting or writing, shaking his head at continuity errors such as in the scene where Ahuja’s henchman becomes a different actor from one shot to the next. “If this film is being seen as the ultimate satire in Hindi cinema, all it tells me is that Hindi cinema hasn’t achieved much.” At other times, he remembered the background to each scene, or the many trials that the crew had undergone. He was often self-effacing, talking about how he made his diploma film Bonga as a tribute to Godard’s Bande Part even though he hadn’t seen the latter at the time. “But I vaguely knew what it was about, and I had seen the famous dance scene.” And he used the word “fluke” a great deal, whether discussing his life or his professional arc. He always emphasized the randomness of things … all of it leading up to the observation about how his iconic film “just happened somehow, nobody could have planned for something like this to be a success”. What happened to his career after JBDY? Many who knew him feel that the set of factors that came together for him in 1982 – a youthful crew with just the right sensibility, their expectations for success set to zero but still hungry to do something they believed in; the NFDC financing a bizarre script and keeping an eye on things without interfering too much – never came together in the same way again. That he wasn’t temperamentally suited to the demands of a commercial industry, he was too much his own person. He certainly experienced his share of disappointments (and it can’t be pleasant for a creative person to repeatedly hear himself described, in semi-pitying terms, as someone who did something brilliant 30-odd years earlier and then never achieved on a comparable level again), but my gut feeling is that he wasn’t the stereotype of the depressed artist who brooded for days about the things that hadn’t worked out. Coincidentally, the last time I met him, he was discussing the “cliché of the misunderstood poet” and how Guru Dutt had handled it in Pyaasa. But he was smiling and gesticulating and speaking excitedly, like a film student, not like someone who felt the theme could in any way apply to his own career. My dominant memory of him is of someone who was always alert and active and curious, even when simply working by himself in his office. Very well written both here and at Scroll. He really looked like an accountant. He made me a movie with bobby deol and karishma kapoor in early 2000s and I was wondering if he's the same guy who made JBDY. Although it's alright to make a totally different film than your previous film. But, did it ever feature in your conversations with him that from 90s onwards, why did he work only with commercial actors despite his disdain for their kind of cinema? Hi sir. Thank you so much for sharing this heartfelt tribute with us. Pessimist Fool: why do you assume he had disdain for their kind of cinema? I never got that impression from my conversations with him. It’s another matter that in his last few films, he probably didn’t get a chance to really work with the scripts he was personally invested in, or with producers who were unconditionally willing to indulge him. Kabhi Haan Kabhi Na is a pretty good example, I think, of a solid, somewhat mainstream film. @ Jai - I was going entirely by this. //If this film is being seen as the ultimate satire in Hindi cinema, all it tells me is that Hindi cinema hasn’t achieved much// Besides, Hindi movies that he mentions date back to 50s and 60s. But, yeah, that doesnt explain his disdain for commercial cinema. I think I read somewhere else too about him being quite pissed at Hindi movies, in general. Anyway, that's lazy assumption on my part.